One can easily make the argument that the combination of starters and backups here are among the worst in the league. I can look at 20 depth charts from the NFL and rightfully say I would rather take their interior guys over what NYG has to offer at the moment. They lack true presence and won’t get a push off the point of attack when faced off against the more physical defensive lines. It created massive problems throughout the 2014 season when NYG tried to run the ball. Chris Snee was never replaced and there is a gaping hole at LG right now. Geoff Schwartz had a year to forget in 2014, missing the majority of the season with injuries. There is the hope he returns to 100% and can offer NYG a reliable presence at RG. However even when he was healthy, he looked very lethargic and over-matched. Jerry was a favorite of mine coming out of Ole Miss a few years back, but I have to admit his career performance to this point has been sub-par. If he is on the team as a primary backup, fine. But he can’t be a starter. I didn’t like the Richburg selection last year but he out-performed expectations in year one, a season that I would assume NYG wanted to be a redshirt year for him to add strength, but was forced in to action at an unnatural position. I think he can be the guy at C but he will need to prove he can get more push. The rest of the names up there lack long term potential. They are training camp body-types. I am intrigued to see what Canadian Brett Jones can bring to the table, however. He has some decent tape from the CFL that will remind NYG fans of a young Rich Seubert. This is a poor group that doesn’t have the nastiness nor do they have star power. Strong Points: Versatile offensive lineman that could likely play any position along the front at a high level. Good use of leverage, plays with a low base and high hands. Strong use of his upper body. Can lock on to a defender and drive him out of a play. Quick feet and hips that can get himself between his man and the running lane. Hustles downfield and looks to throw the extra block. Long arms and thick legs with room to grow. Flawlessly made the move to center from left tackle halfway through the 2014 season. Patient blocker that allows the action to come to him. Can pounce on the inside defender quickly and lock him up. Weak Points: Loses his power presence as an outside pass blocker. Feet get stuck in the mud against the faster, quicker, more agile pass rushers. Gives up too much pressure off the edge. Doesn’t roll his hips in to the defender enough, losing out on power output. Does not show the kind of control of engagement you want out of a pass blocker. Still raw around the edges. 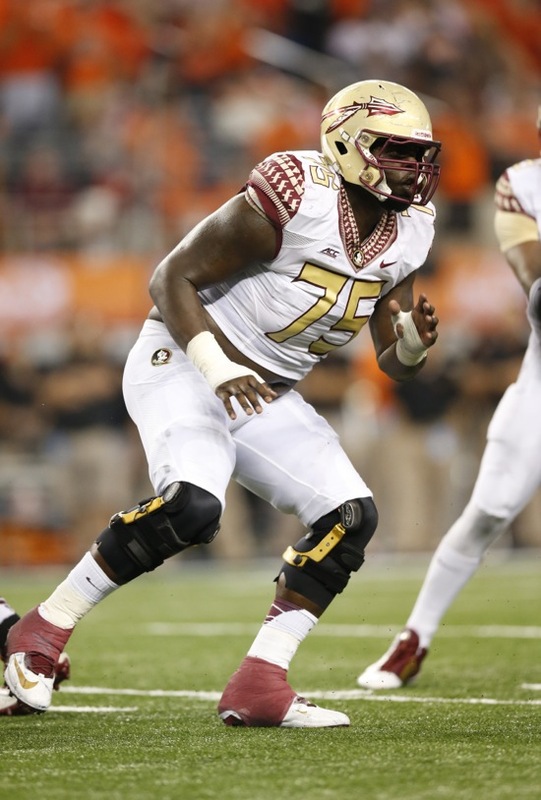 Summary: Erving redshirted his first season at FSU because of a back injury. In 2012 he was one of the team’s primary run stuffing defensive tackles until he made the move to left tackle prior to the 2012 season. He’s been locked in as a starter ever since and has made several All-American teams. His performance as a pass blocker held him back from the elite grade. He struggled against some of his toughest competition, allowing too much pressure to the outside speed rush and double moves inside. His pad level and road-grading style was always best suited inside. He showed his versatility in 2014, moving to center and playing at a very high level. Best suited at center or guard where his weakness as a lateral mover in pass protection can be hidden. His raw strength and power is NFL ready and versatile linemen like this are always in high demand. *Erving has moved all over the field. He was a solid run stuffing DT. The he made a move to LT where many viewed him as a potential top 10 pick. He really struggled there and I said back in the fall he’d be lucky to be a 3rd round pick. I was hoping to see him get moved inside because I thought his skill set was best suited there. Well my wish was granted and Erving really delivered. This guy can be a dominant interior player. He plays with great pad level and heavy hands. He can adjust well in short space and his ability to reach the second level is up there with the best in the class. I think Erving has the highest upside of all the interior blockers. He would present outstanding round 2 value with his ability to back up several spots and even start from day one at one of the three interior positions. I think someone will take him in the top 25 overall. Strong Points: Ideal frame for the position. Thick but athletic and powerful with long arms. Can plant his feet and anchor his position against the biggest of defenders. Shows the initial pop out of his stance to stifle his defender and drive him out of a play. Can lock on with his hands inside and keep his feet moving forward. Creates elite power with his combination of speed and strength. Good knee bend with a low base and upright torso in pass protection. Gets the initial punch and can control pass rushers with his hands. Weak Points: Shows a lack of mobility in space and has a hard time reacting to late movement. Struggles to adjust his weight on the move. Not as effective as a pulling lead blocker. Will be slow to reach his spot in space. Relies too heavily on his upper body strength, needs to show more consistent footwork. Summary: Cann is an All-American guard that has started the second most games in South Carolina history. He is a two year team captain with rave reviews from the coaching staff when it comes to his work ethic and leadership ability. He wins a lot of one on one battles with initial movement and power, consistently firing out of his stance and getting his hands on the defender. He is at his best as a straight ahead, power run blocker. He may struggle with speed and quickness in space. The further away he gets from the line of scrimmage, the more his footwork and lack of reaction speed are exposed. He shows dominant traits but will need to become a better athlete if he wants to stay at left guard. He could be an early starter at right guard in the NFL. *Cann could easily be the top interior guy in this class. He is a much better athlete than you think. He got better as the year went on and while I won’t say his blocking on the move is a strong point, he showed that he can get the job done well enough to play in a moving role here and there. He’s at his best in a straight-ahead role, as he can produce the necessary power out of his stance and can jolt a defender with his punch. The amount of experience and the fact that he is a top notch worker off the field will be attractive to NYG. He is the only one of these top guys that has played LG as well, something you shouldn’t overlook when projecting who NYG will like. If I had to pick a guard that I think will both be available in round 2 and liked by NYG, Cann is it. Strong Points: Experienced and productive interior blocker with plenty of power and strength. Ideal frame for the position. Wide frame with thick legs, long arms. Easy bender at the knees with light, but powerful feet. Excels as a run blocker, getting a strong pop out of his stance and can win the initial battle after the snap. Good body control and balance when he keeps his chest upright. Can anchor his position against the strongest of bull rushers. Uses his weight well. Weak Points: Gets top heavy at times and will dip his head. Won’t lock on to defenders, leaving him very susceptible to double moves. Doesn’t find to maintain an inside hand position. Late to pickup blitzes and stunts to his outside shoulder. Doesn’t recover well after being initially beat. Technique needs a lot of work. Summary: Over 50 career starts after beginning his football career in high school. Grew up in Jamaica and moved to Chicago, getting a later than usual start to his football career. Has the physical makeup and talent to be a dominant player but is still raw around the edges. Tomlinson will look like a top tier prospect on some plays but then show a lack of skills on others. He needs to be coached up at the next level but everything about him off the field leads me to believe the work ethic will be there. High upside prospect here. *Traditional guard prospect here. Has that wide, square frame and he consistently makes it tough for guys to get around him. Really wide wingspan. I don’t get a lot of “inside” information regarding NYG and when I do, I’m not always confident it’s legit. NYG is pretty tight lipped. With that in mind I have been told they like Tomlinson a lot but they may view him as a RG-only player. If Schwartz is going to be there, maybe the view Tomlinson as a guy that will sit a year? With all the OL talent in this draft it’s hard to imagine them bringing in a guy they know will be a backup. Tomlinson doesn’t have any wow-factor to his game but he can hold up against the elite power players day one in the NFL. He doesn’t block as well on the move though and I think it’s enough to knock him down more than people think. He would be a solid round 2 value but I think there will be several guys available with a higher grade. Strong Points: Powerful, squatty type blocker that gets off the ball quickly and delivers a violent punch to the defender. Thick and strong frame that appears to be maxed out. Easy bender at the knees, can produce a lot of power from his legs. Quick in a phone booth, works hard to get across the face of a defender when he needs to. Can shift his feet to stay in front a pass rusher. Shows the balance and body control as a pass blocker when the action is in front of him. Can anchor his position and hold ground against the bigger, more powerful defenders. Smart player that can mentally anticipate the stunts and blitzes that defenses throw at him. Weak Points: Lack of athleticism shows up in space. He isn’t nearly as effective as pulling blocker to the outside or at the second level when he needs to deal with linebackers. Too often the defender will get off his blocks with lateral movement, needs to show more control of the engagement with his hands. The quick-twitch reaction isn’t always there. Has the tendency to get top heavy, forgetting to move his feet and leaving him in a prone position to get beat. Summary: Three year starter at Right Guard that has never missed a game since earning that spot. Received a 3rd round grade from the NFL Draft Advisory Board in the winter of 2014. Jackson may be the top RG in the nation after displaying his ability to produce equally as a run and pass blocker. He can handle the power game of the NFL right away, but may struggle with the speed/quickness/complexity of blitzing and stunting fronts. Jackson is not a fit for every scheme because he appears uncomfortable in space and on the move. In a power scheme however, Jackson can be a day one starter at the next level. *I like Jackson every time I watch the FSU game tapes. He is a guy that rarely gets beat. He doesn’t make it look pretty always but watch him play after play and the defender he is assigned to rarely gets in on the action. He can lock defenders up and play the power game, but also moves his feet quickly with balance in pass protection. I question his explosion and short area quickness when moving with linebackers in space. He had some trouble reacting at times and there are several guards that are better when it comes to pulling out of his stance and lead blocking. If NYG can use a straight ahead power blocker rather than a lateral mover, Jackson is worth a day 2 look. Strong Points: Squatty and quick off the snap. Very good body control and balance from start to finish. Easy bender at the knees. Hands are constantly fighting to get inside with a violent punch or stab. Sets up in pass protection quickly. Plays with a low center of gravity and can deliver a lot of power from his lower half and hands. Stays square to the pass rusher. Functionally strong. Quick to pull out of his position and reach the outside as a lead blocker. Effective in space against the faster defenders. Quick twitch reaction. Forecasts the action well, showing the anticipation and instincts teams want from a center. Weak Points: Struggles to adjust to the quicker, more advanced pass rushers. Won’t lock on to a defender and finish his blocks. Doesn’t change direction well in space. Lacks the physically dominant traits. Summary: Fifth year senior and four year starter. Second team All ACC. Gallik is a consistent presence inside that shows a lot of effort throughout a game. He can do a lot of different things from the inside. He shows quick hands and feet after the snap, consistently getting his hands on the defender first and sticking to his man. Very good athlete that can pull to the outside and lead block. Experienced and smart, Gallik has a lot of starting-caliber traits to his game. His strong, athletic, squatty frame could start early on at the next level. *If NYG was in dyer need of a center, I would be calling for Gallik on day 2. I love his game and his consistency. He rarely gets beat at the point of attack and he is always in position at the second level to seal off backside defenders. Would NYG possibly view him as an OG? Probably not. He doesn’t have the width that your typical OG has and his frame is likely close to being maxed out. He needs to play C in the NFL. Would NYG draft Gallik and keep Richburg at LG? Another probably not. If this guys keeps falling in to day three however, there may be a point where you just need to pull the trigger on bringing him in because he is going to be a quality player. Strong Points: Gifted tool set with top tier strength numbers. Has a long, lean frame. Able to bend at the knees and sustain good balance and body control. Plays a violent game with his upper body. Goes after the defender, consistently initiating contact and delivering a strong punch. Can keep his feet moving to mirror defenders. Able to stick to his man up and down the pocket. Can crash down and reach the inside gaps in a blink. Shows good quickness while maintaining his balance. Hustles downfield and will look to make the extra block. Easy mover in space, very good speed and change of direction. Can pull out of his stance and accelerate to lead block. Powerful presence on the move. Works hard to sustain and finish his blocks. Weak Points: Will get sloppy with technique the further from the line he gets. Spends too much time with his chest facing the ground. Needs to be more consistent with posture and body positioning. Late to react to blitzes and stunts, needs to be more aware. Will often rely too much on his upper body, leaving him prone to the double move and penalties. Summary: Fifth year senior. Spent two years playing guard, but moved to left tackle in 2014. Most likely a guard in the NFL. Douglas is one of the more impressive linemen in the nation when it comes to workouts and tools. He has great length but is a monster in the weight room and has elite level speed for the position. He has shown steady improvement from a skill set perspective and is beginning to prove that he has everything a coach could want out of a guard in the NFL. If he can clean up specific technique issues, he can be a long term starter. *Douglas is a better athlete than what he showed at the combine. I actually think he is one of the top athletes among all OL prospects. I love the position versatility he presents. He has both the skills and tools to be a guy that backs up guards and tackles early in his career but I think his talent will eventually shine bright enough to get him a starting nod somewhere. Quality player that plays hard and has the aggression NYG needs in there. *A lot of what I said about Gallik can be applied to Dismukes here. He is widely considered the top C of the class outside of Erving, thus I think he can be a 2nd rounder. I would consider him in round 3 but I think Gallik will be available longer than Dismukes. Dismukes is a better mover but lacks the power against power defenders. When it comes to overall upside they are comparable but Dismukes fits in to the zone schemes more while Gallik is more of a power guy. Depending on your scheme they are both good values in round 3 or 4. Strong Points: Powerful presence inside with a lot of experience on both sides of the line. Gets out of his stance quickly and will get his hands inside. Can create a lot of power from his lower body. Quickly turns his hips in to the hole and will push his man out of a running lane. Reliable and forceful run blocker. Smart and savvy. Reads the defensive front post-snap and is rarely caught off balance. Plays with a low center of gravity and can bend his knees with ease. Effective on the move. Can pull out of his stance to trap blocks. Adjusts on the run, processes information quickly while maintaining his power presence. Recovers well from being initially beat. Weak Points: Feet get stagnant as a pass blocker. Will rely on strength and power too much, neglecting constant foot movement and placement. Lacks the lateral range to effectively pull to the outside and lead block. Body control isn’t always there when he’s in space. Summary: Four year starter that has dealt with a few minor injuries over his career but for the most part has been a mainstay on that offensive line. Miller plays in a scheme that puts him on both the left and right sides, respectively. His game is based on power and awareness. Typical squatty build for the position. Has good enough foot quickness and strength to start in the NFL. He will need to learn how to equally rely on athleticism and overall strength. He has the tools to be a quality player but will need to shore up his footwork and mechanical issues first. *There wasn’t a more impressive OL at the East/West Shrine Game than Miller. He was a favorite of mine heading in to the 2014 season. He can be a dominant run blocker with his power and length. He took a step back as a pass blocker though once I started to track his plays. He needs technique work more than anything, thus I don’t see him as a long term project or anything. He’ll get a starting job somewhere in the league within a couple years. Not as great as I initially projected but you can do much worse than him with your 3rd rounder. Strong Points: Quick start, gets set up out of his stance in a blink. Consistently puts himself in to good position, ready to engage. Knee bend is there with light feet and high hands. Works hard to stay inside the shoulders of his man. Can swing his hips in to the hole, athletic ability is there. Aggressive but patient pass blocker. Can wait to see what is going on prior to attacking hard with his hands. Has the speed and quickness to pull out of his stance and get in front. Good second level blocker, can adjust to the speed of linebackers. Can pivot and turn his bodyweight quickly. Weak Points: Struggles to recover after being initially beat. Doesn’t always roll his hips in to the defender, will get too upper body dependent. Will over-commit his bodyweight and leaves himself prone to double moves. Mental reaction to stunts and blitzes are delayed. Inconsistent footwork. Summary: Fifth year senior. Spent his first two seasons Lackawanna Junior College. Redshirt in 2012 and a two year starter at right guard for the Mountaineers. Glowinski is a former tackle that made the move to guard prior to the 2014 season. He has the quick feet, set up, and knee bend to handle the speed and quickness of the NFL. He is a gritty blocker that loves to use upper body strength and power to dominate defenders. There are a lot of tools combined with an admirable style of play that coaches will want to work with. He needs to improve a couple of vital mechanical flaws before he can be depended on. If he can do that, there is starter potential here. *I have a decent amount of OG/C graded in the 74-75-76 range. I think the best value in terms of where you can draft these guys is going to be Glowinski. Most see him as a 6th or 7th rounder and I would sign for him in round 5 right now and consider it one of the steals of the draft no matter what. Glowinski is quick out of his stance, quick to get his hands on, and quick to swing his hips. He is a former left tackle that can still move like one. He needs to become more lower body dependent if he is going to anchor against NFL-caliber DTs, but this is simply a guy that knows how to play and I would bet a good amount of money on him being a starter down the road and is one of those guys you never hear from because he is always getting the job done. Strong Points: Right away, sudden type quickness to his game right after the snap. Can set his feet and get his hands up fast while maintaining all of his balance and body control. Easy mover with agile hips and light feet. Shows proper footwork consistently. Stays square to his, able to mirror. Good knee bender. Can shift his weight laterally without a problem. Comfortable in space, can stick with linebackers. Can pull out of his stance and work his way through the line and in to the second level fast. Smart and savvy, responsible for making line calls and adjustments. Quick reaction both mentally and physically. Weak Points: Not overly stout at the point of attack. Gets pushed back by the bigger, more powerful defensive tackles. Doesn’t stifle a defender with a strong punch. Won’t always finish his blocks. Needs to add a more physical, more aggressive approach. Will need to add strength and bulk to his frame. Summary: Fifth year senior and four year starter. All-American center that has been the leader of the Oregon offensive line for a few years now. Grasu plays with exceptional agility and quickness, moving out of his stance as fast as any interior linemen in this class. He is comfortable at the point of attack as well as in space. He will need to spend some time adding a power element to his game, however. His ability to anchor against the bull rush will be challenged in the NFL and he needs to be able to move guys out of running lanes. He can get by in certain schemes right now, most notably zone, but he may not be as NFL-ready as some other players with these accolades. *This is a four-center draft and Grasu brings up the rear of the group, but by no means does that mean I don’t like him. As you can see, he finished with the same grade as Dismukes and not far below Gallik. Grasu is on the undersized side but the Oregon scheme called for him to play under 300 pounds so he could maintain a fast pace of play. He can likely add some bulk at the next level. Grasu is one of the more natural athletes of this entire group and he may be the smartest center I’ve seen since Alex Mack. He had a ton of responsibility at Oregon. Talent wise I think he needs a year before he can handle NFL power but some schemes can really hide a guy like this. If you want a smarter, athlete-type in the middle, Grasu may be your guy. *He’s been a fun story to watch and follow. Rarely do you see a D-III player finish with this high of a grade, no matter the position. His strong week at the Senior Bowl really helped. We are still talking about a guy that likely won’t contribute until 2016. Hard not to think of Rich Seubert when I watch him. *. Has experience at right and left tackle, but is a candidate to move inside in the NFL. Poutasi has all the power a team could ask for. He is hard to push back and can control the defender right in front of him with leg drive and heavy hands. His weaknesses arrive when he is asked to slide to the left or right. His athletic ability is very limited in space as a pass blocker. He can carry a lot of weight comfortably and has shown the ability to dominate when moving straight ahead with minimal lateral duties. His future will most likely reside as a guard in the NFL where he could someday be a quality starter. *Five year senior with over 40 career starts. Shead has the potential the top run blocking guard in this class. His frame and initial pop out of his stance along with good technique allows him to play a physical, power-based game. He needs to work on pass blocking footwork and movement, but the tools are there. He can be a backup with a long term future as a starter. *Coaches favorite and team captain. Has a good amount of experience at guard and center. An underrated athlete with really good weight room strength. Garcia started to break out a little and I know a few guys that think he is better than any of the centers I discussed above. He might be a guy you look for day 3 and becomes a starter in year 1. *Three year starter. Had high hopes for the 2014 season but was slow returning to his former self after a shoulder surgery during the offseason. Showed poor conditioning throughout the season. Was bounced back and forth between LG and LT as a result of injuries along the Texas A& M front. Considered to be the most athletic lineman on the team but didn’t display that kind of ability in 2014. His power and strength are best suited inside at guard where he could be a starting caliber player if he can stay healthy and improve his conditioning. *All American and All SEC performer. Fifth year senior that has overcome a couple of major knee injuries to finish his career as a two-year starter. He is a high upside lineman with enough physical ability to play right away in the NFL. He is a wide shouldered, long limbed, athletic blocker that has improved his skill set by a wide margin since last year. He can be an equally effective run and pass blocker that can match up against any kind of defensive lineman. His medicals will have a big impact on where he gets drafted but talent wise, Kouandjio can be one of the best interior linemen in this class. *I’ve always had a thing for Cotton and I am surprised he didn’t get more attention leading up to the draft. He is an easy mover and maintains his power/strength on the move. Really good fit for teams that use a zone blocking scheme. Cotton maintains his power on the move and can reach guys in space that most guards cannot. He is behind schedule when it comes to strength and power levels, but he’ll eventually develop in to a quality backup and possible starter in the right scheme. *I had a much higher grade on Matias earlier in the pre-draft process and thought he could have been a 2nd rounder. But the deeper I look in to his game, the more I noticed his significant mechanical issues and inconsistent use of his tools. He isn’t the athlete I initially thought he was, either. Matias can be a player down the road but hr won’t offer much as a backup because he appears to be a RG-only type guy. *Fifth year senior that has started every game of his playing career. Has starts at tackle, guard, and center. Mancz is making a big jump in competition and will need a year of NFL weight training before being thrown in to the mix. With that said, he does all the little things right and is ahead of the curve compared to other prospects when it comes to his technique and mechanics. He certainly moves like an NFL caliber blocker after the snap whether he is in traffic or in space. There is a lot to like about his approach and performance. He has starter potential if he can physically develop in to a stronger, more powerful athlete. *Always have to be weary of OL coming out of this program because it’s so run-heavy and they lack NFL technique. Mason was a dominant straight ahead blocker and surprised many with his ability to drop back at the Senior Bowl. There is a size issue here but he can be hidden at C, the spot most are projecting him to move to in the pros. This group from a depth perspective is a more impressive one that what we had to work with a year ago. There are several guys that could come here and backup both guard spots, but also compete for the starting LG spot. I really like the centers at the top of the group as well and even though NYG thinks they have their long term starter in Richburg, bringing in one of them if the value is there wouldn’t be a bad idea. NYG has the flexibility to use Pugh at LG if they draft a quality OT, but I can’t say I would want him in that spot over one of the top guys on this list. The good value of G/C in any draft is usually found from round 3 on. It is no secret that NYG needs to bring someone new in to the mix. The question is, do they gamble by waiting and hoping a value falls, which usually happens at this position, or do they “panic” and grab one of these guys in round 2. It’s tough to argue against either side but I have always believed that a good OL makes everyone else better than they really are. It’s not a group you should want to get cute with. NYG is in a tough spot with who is on the current roster at the position. Waiting almost appears to be not an option. NYG needs a guard, and it ideally they can get one before their 4th round pick. A few of those names will be available when they are on the clock in round 3 and the value will warrant that selection being used on one of them. It would almost seem foolish to pass on unless of course they use their first pick on one of the top OTs. Don’t forget that some of the quality OT prospects have the tools and skill to shift inside and play guard, a trend that is very popular around the league these days.